Today I was faced with cooking the dreaded chicken breast, which I normally hate because they tend to be dry and tasteless. 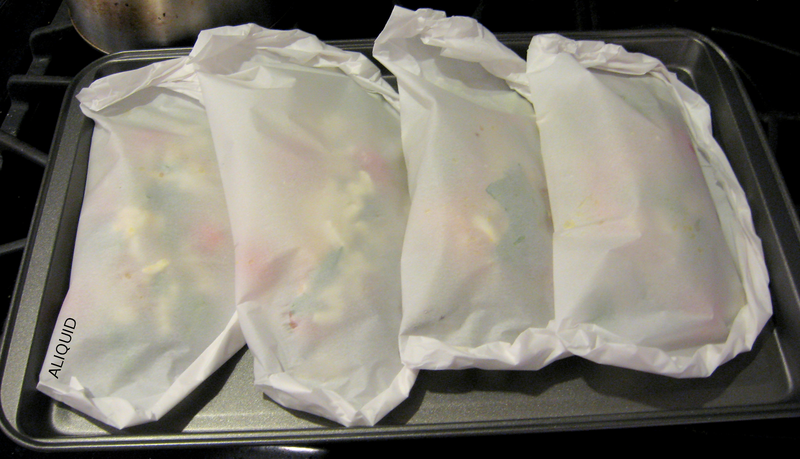 My husband suggested trying to cook them en papillote (apparently he heard about it on NPR), which just means you wrap the food in a parchment paper packet so it steams in its own juices. 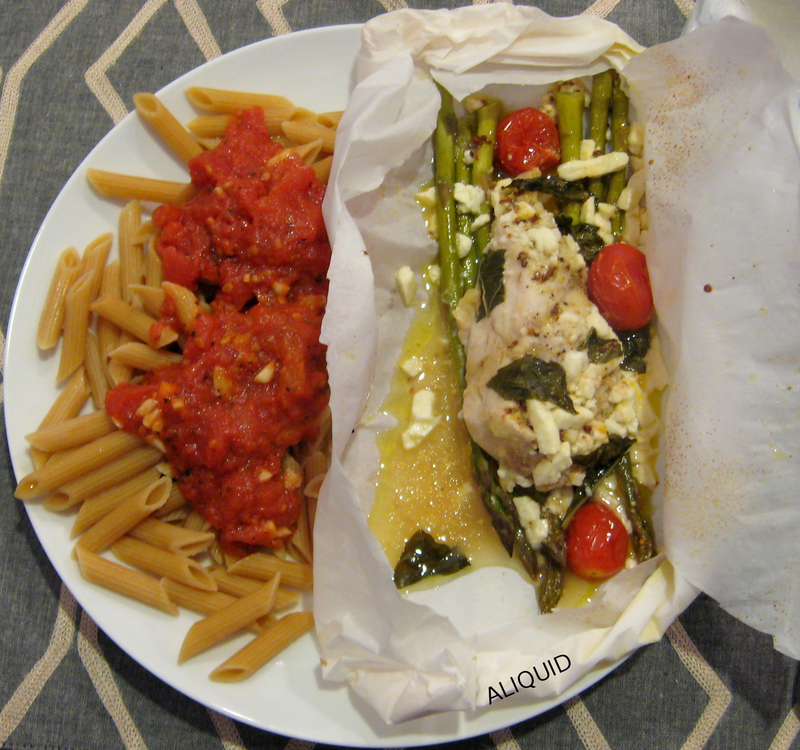 I followed this recipe from Martha Stewart, except I omitted the artichokes and olives for budgetary reasons. 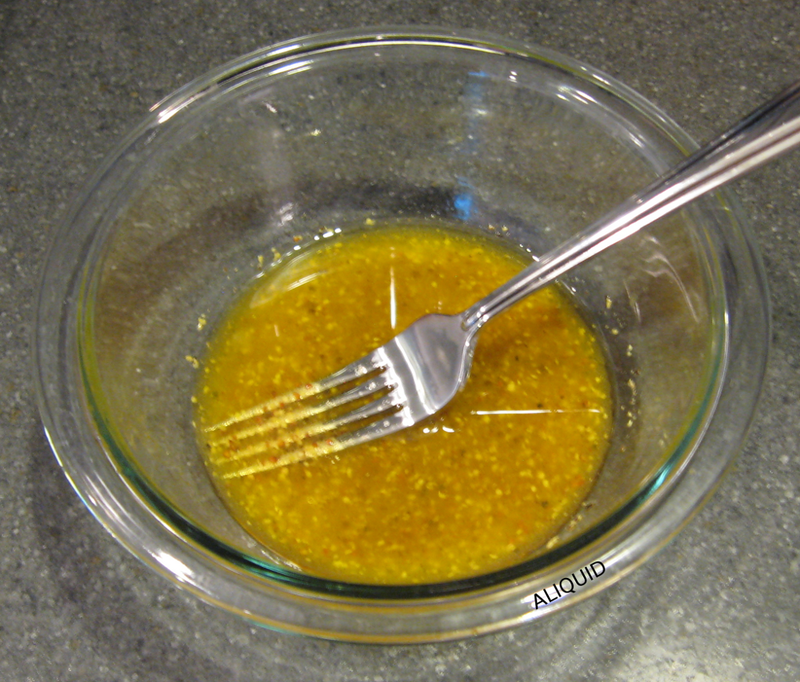 First you mix up a mustard vinaigrette. 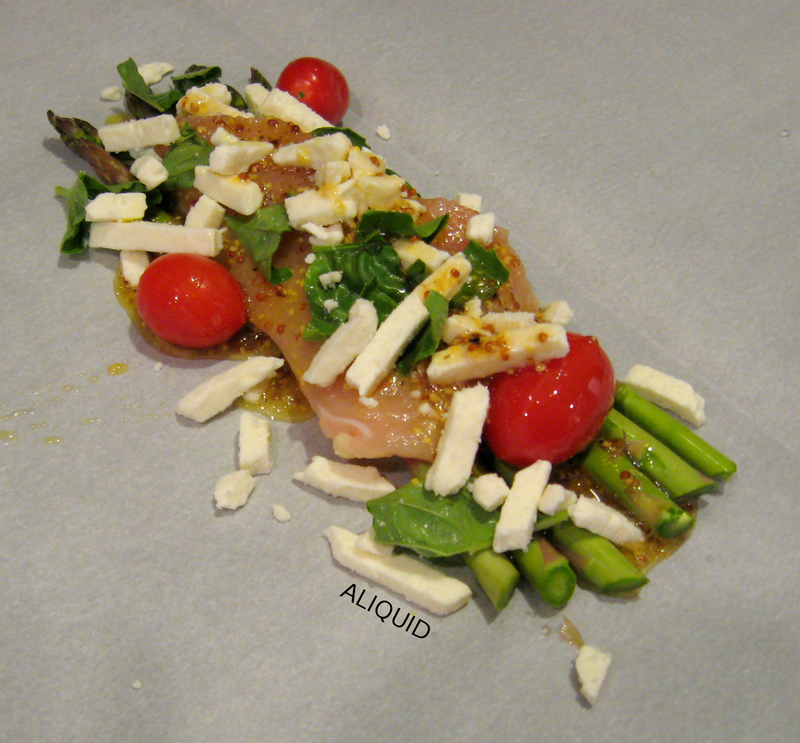 Then in the middle of a piece of parchment paper, you make a little bed of asparagus and top it with a half chicken breast, some vinaigrette, feta, basil and tomatoes. Because it cooks all sealed up, the chicken stays moist and tender. It's relatively low-fat (unless you drink all that leftover dressing at the bottom...) And it's very flavorful thanks to the mustard vinaigrette. 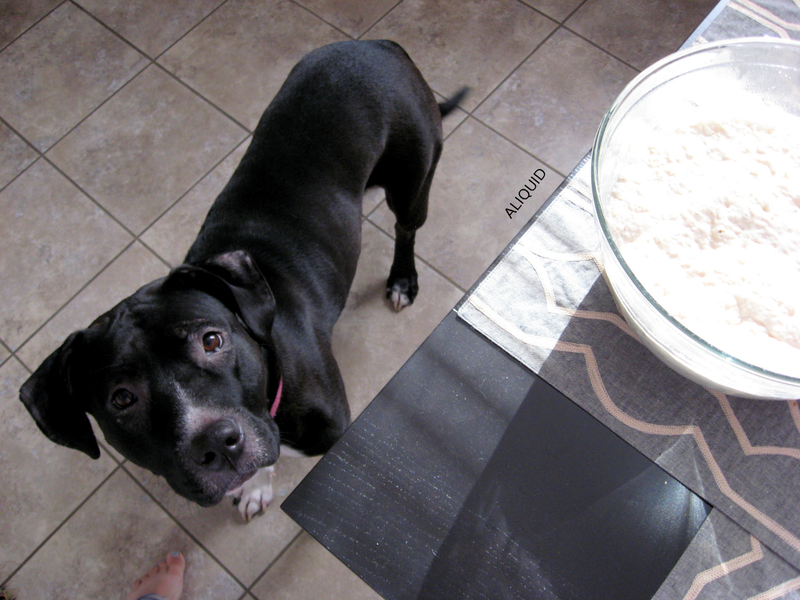 We both agreed this recipe needs to go into my chicken breast recipe rotation! Everyone ready for the 31-Day Challenge starting tomorrow? I am!! I bought this polish a while ago when a lot of people were going nuts over it, but never wore it until today. I just felt like wearing a glitterbomb! It's a Trap-eze! 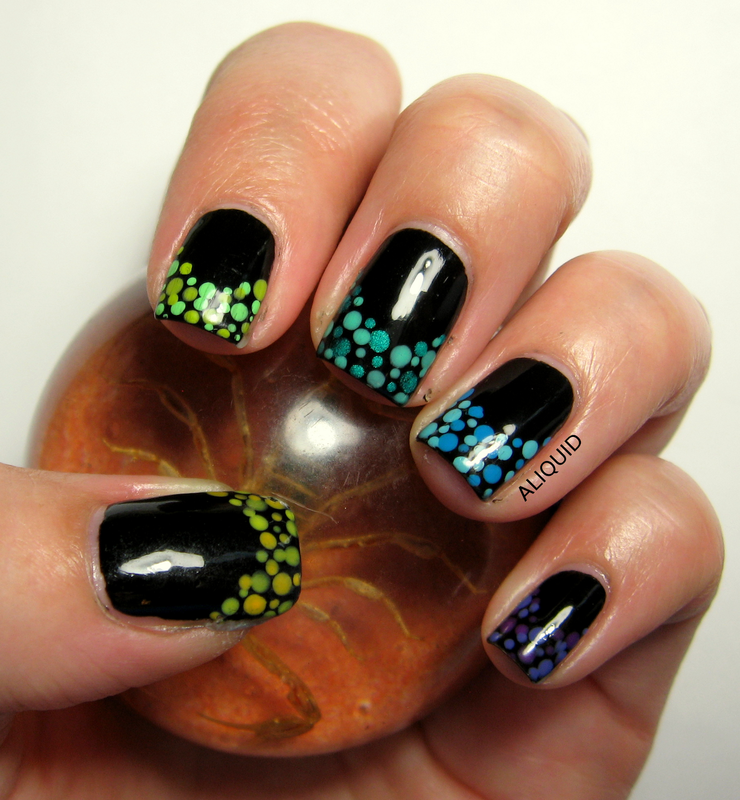 comes from China Glaze's Cirque du Soleil: Worlds Away collection from last year. It's got silver, magenta, orange, yellow, green and blue hex glitter in two different sizes, suspended in a milky base. China Glaze It's a Trap-eze! 3 coats with Revlon Matte Top Coat. I needed three coats to get decent coverage of my nail line. The polish itself was easy to apply, but I did need to dab on glitter to get it even (and still ended up with some bare spots). I think it looks better when mattified like this, but YMMV! It's a Trap-eze! doesn't seem to be available at sallybeauty.com anymore, but you can still find it on Amazon (which is where I bought mine) for a low price. 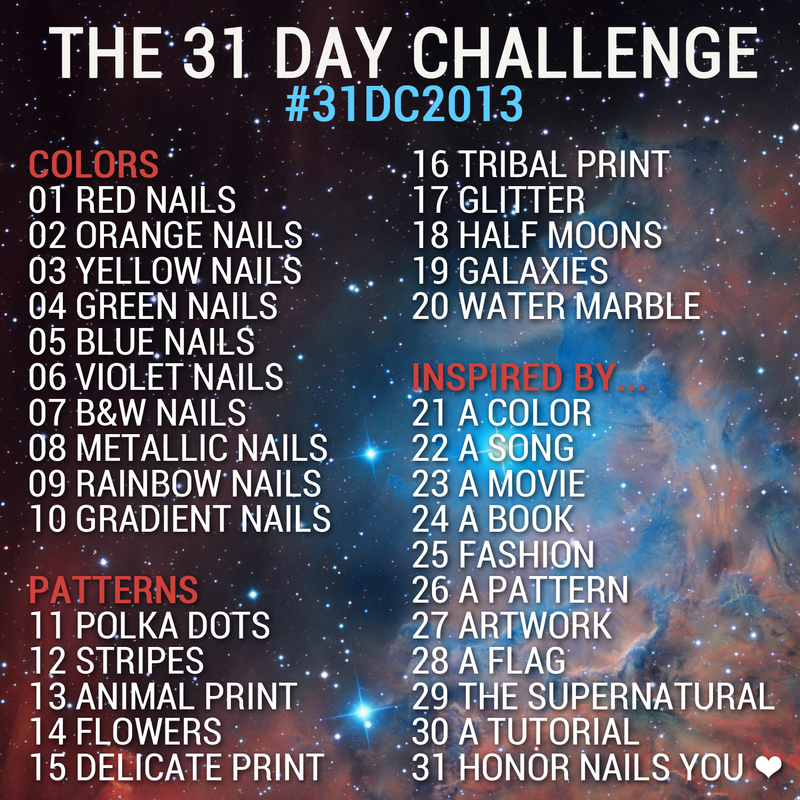 In other news, I thought I'd mention that starting September 1 I'll be attempting the 31 Day Challenge! Sarah at Chalkboard Nails (one of my absolute favorite nail blogs) will be updating daily, and I'll do my best to keep up. I'm no great nail artist, so it should be good practice for me! If you want to join in, here's the schedule and hashtag! Another day, another batch of cookies. This is another variation on Mark Bittman's butter cookie recipe; it's the same as my butterscotch cookies except I used 3/4 cup of white sugar in place of the brown sugar, and I added 1 tsp. cinnamon and 1/2 cup craisins to the batter. 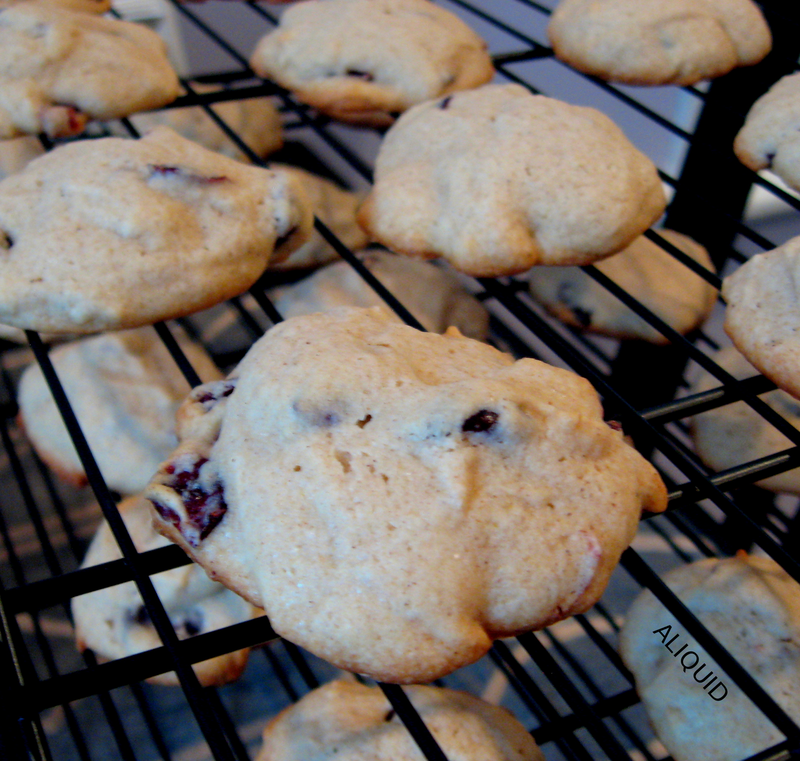 These turned out softer and moister than my last batch of cookies. They're like cinnamon raisin except with more zing--the tartness of the craisins really complements the butteriness of the cookie! Recently I bought a few stamping plates from MoYou, because I hardly have any and I want to start doing stamping more. One of the plates, Pro Collection 09, has a bunch of cool floral stamps I wanted to try, so I thought, instead of using one or two, why not use four? I used Orly Coachella Dweller for the base and Revlon Stiletto for the stamps. I like the idea of doing flowers in black, 'cause it's kind of the opposite of what you'd expect! 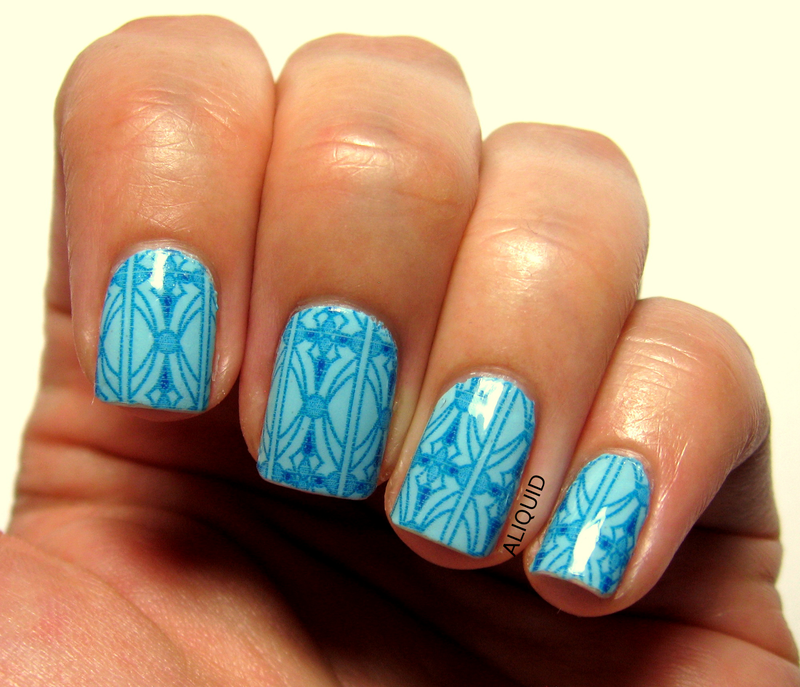 I think the stamp on my index finger is my favorite of these, but there are 14 more on the plate so I need to try more! 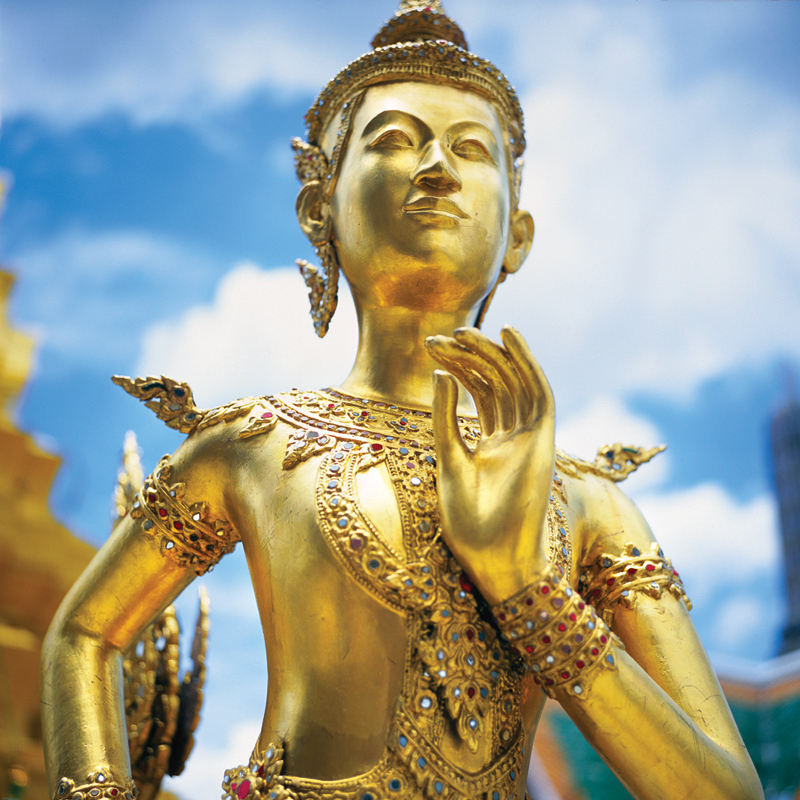 As I was writing my conference proceedings paper last week, I had the idea to write a bit about some of the unusual (to English speakers) features of one of the languages I worked on. I'm thinking of turning this into a series, if I can come up with enough material for it--it's cool to see how diverse languages really are! Fula (aka Fulani, Fulfulde, Pulaar) is a language of sub-Saharan Africa, spoken by somewhere between 10 and 25 million people (estimates vary); that makes it one of the top 100 most widespread languages in the world. 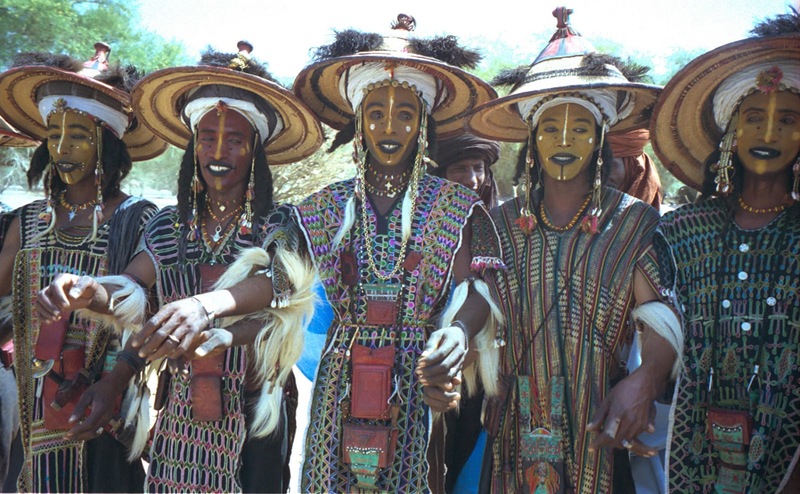 The homeland of Fula is somewhere around Senegal in West Africa, but since the speakers of Fula were originally nomadic herders--and sometime Islamic imperialists--they spread as far east as Sudan. So dialects of Fula are now spoken in a band across the continent. Some early European scholars studying Fula found its grammar to be so complex that some wondered (half-seriously) how the language could ever have developed naturally. What could have gotten them so flummoxed? I'm going to tell you about two linguistic features of Fula that seem pretty bizarre, from a European point of view (neither of which are actually unique to Fula). The two genders get different endings (-o for masculine, -a for feminine) and different articles (the two words meaning 'the'). WHOA!! Not only did the suffix change, but the first consonant of the root changed too! This is known as initial consonant mutation, and it's a feature of Atlantic, the small subfamily that Fula belongs to (it's also found in the Celtic languages). The consonants of the language are arranged in sets of up to three, called grades (for example, w, g, ng), and the first consonant of any noun or verb root switches between the consonants in a set. Each noun class requires a noun to use a certain grade of consonant. Another example is the word for 'a Fula person', which is Pull-o in the singular but Ful-ɓe in the plural. If you want to get a feel for how Fula sounds, here's a recording which I guess is of a Bible story. *The symbols ɗ and ɓ stand for a special type of d and b that are made by drawing air into the mouth instead of expelling it. 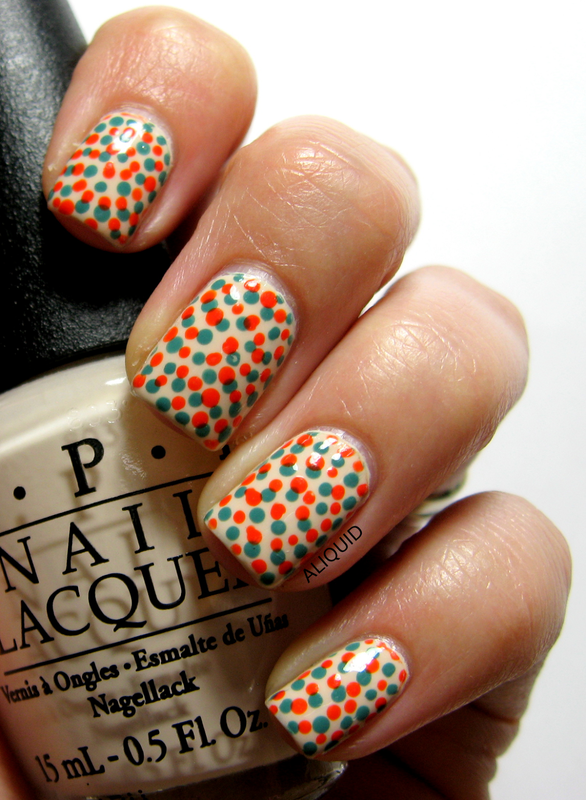 I like the mix of different colors and dot sizes on each nail! Kind of reminds me of fish eggs. ring finger: Wet n Wild I Need a Refresh-Mint, Sally Hansen Blue Me Away! Oh, totally unrelated, we're officially Massachusetts residents now! I'm going to be honest with you: I'm 27 years old and until today, I'd never baked a loaf of bread in my life. 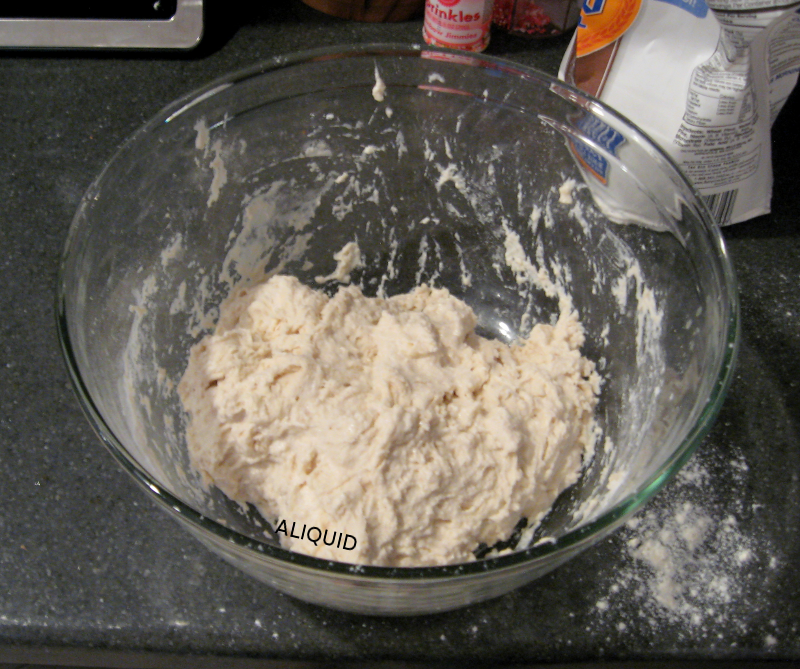 I wasn't really sure what bread dough is supposed to look like, or even what ingredients are in it ("Are there eggs in bread?" I asked my husband once). So I figured I would probably screw up my first couple of tries. But nope, this recipe is pretty much foolproof, and as the name implies, it actually requires almost no work, just a lot of patience. 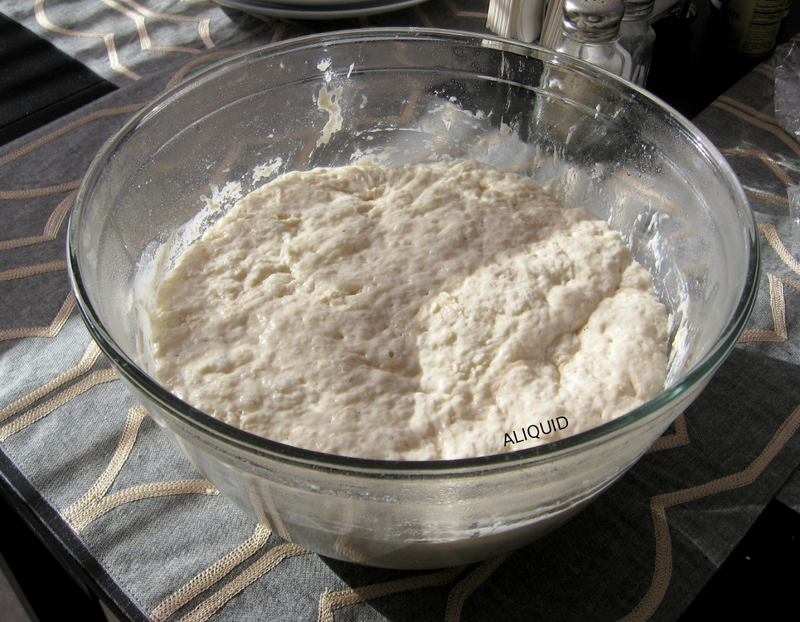 Here's my dough right after mixing. This is like 90% of the work you do right here. ...yep, I think it turned out OK.
Our plan was not to eat any until lunch, but that plan was quickly abandoned. We waited impatiently for 10-15 minutes until it had cooled a little, then buttered up some slices. The first words out of my husband were "holy s**t!" (and he doesn't swear much). 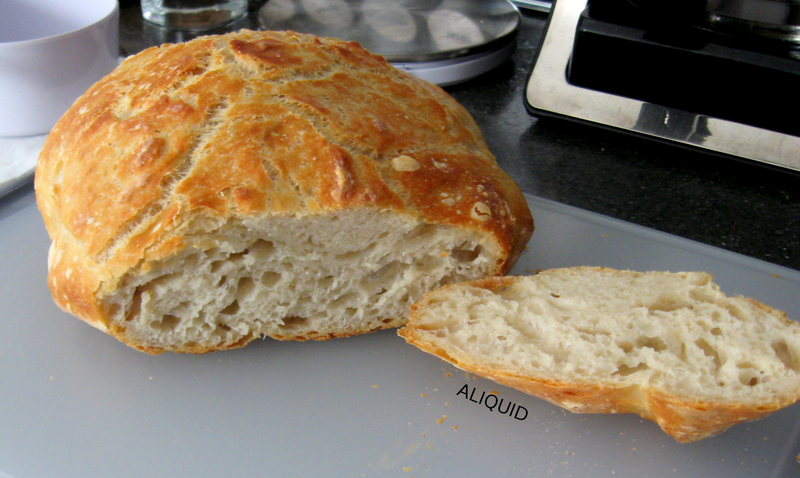 This bread has super crispy, yet thin, crust, and the inside is chewy and filling but still airy at the same time. I'm still slightly in shock that I'm actually capable of making bread...I just wish I had made more (this loaf is more than half gone already, and I just made it this morning). 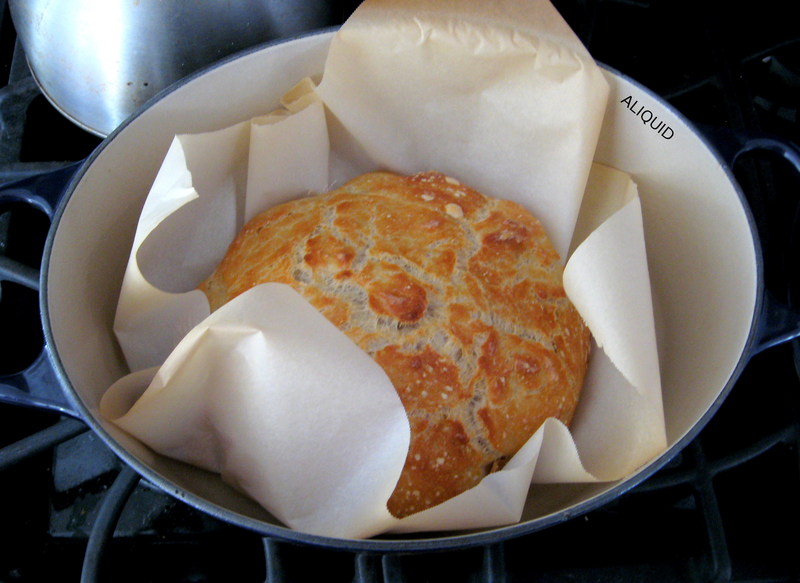 Seriously, if bread seems like too much work to you, try this recipe! Hey all! I haven't posted in a few days because I've been working on a proceedings paper for a conference I presented at in March. But now my paper's submitted, so I can (momentarily) kick back and post my nails! As the post title suggests, these dots are supposed to make spirals, which you can kind of see on my index finger, but I think I put the dots too far apart. Oh well, live and learn! I do like the color scheme though--the base color is OPI My Vampire is Buff, and the dots are L'Oreal L'Orange and Sephora by OPI Ocean Love Potion. One day I'll redo this pattern but BETTER! BTW, anyone else thinking of preordering any of the I Love Nail Polish Ultra Chromes? They look pretty fricking amazing, I must say! The other day I noticed Trudy was looking a bit mopey, and I suddenly realized we had forgotten to celebrate the second anniversary of her adoption (August 5)! So I'm publicly apologizing and presenting her with this lovely PNG I made all by myself. We don't know when her actual birthday is, but her adoption day is more important anyway--it marks the day we brought our new best friend into our family. We've had two years of cuddles, kisses and playtime, and we're looking forward to many more! 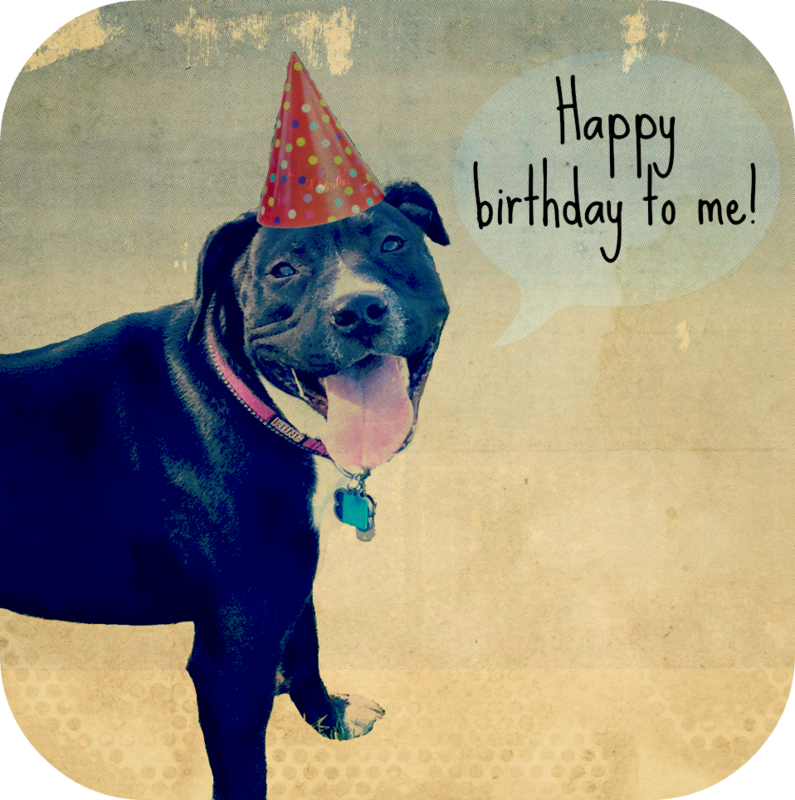 On a less sappy note, this is my 50th post on the blog! I know it's not very impressive compared to all the big successful blogs, but I'm glad that I've been motivated to keep on posting. It's been a lot of fun so far, and I think it's just going to get better and better! Today I'm wearing another set of nail wraps from Incoco (you can read my earlier in-depth review here). 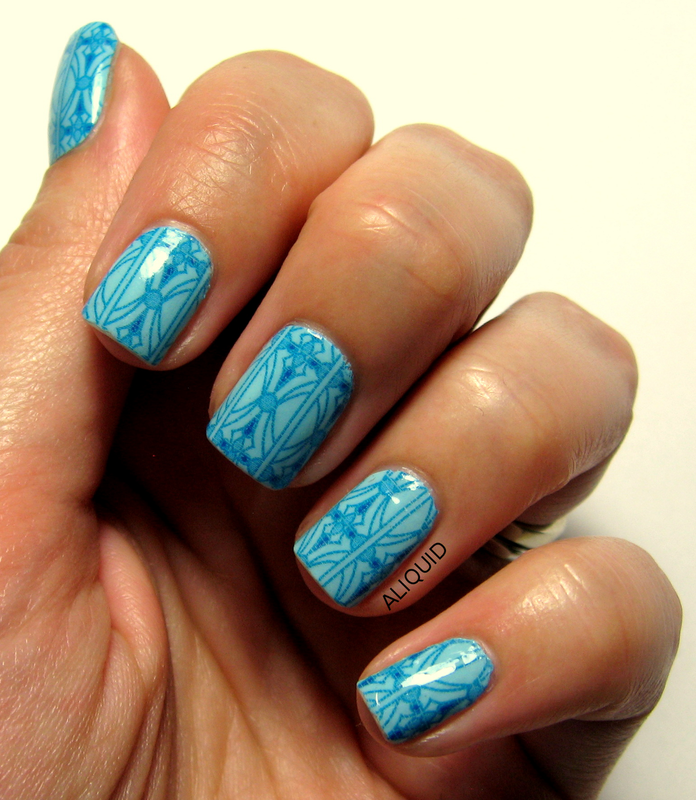 This set, Topaz Treasure, has a subtle but elegant pattern in a cheery sky blue! 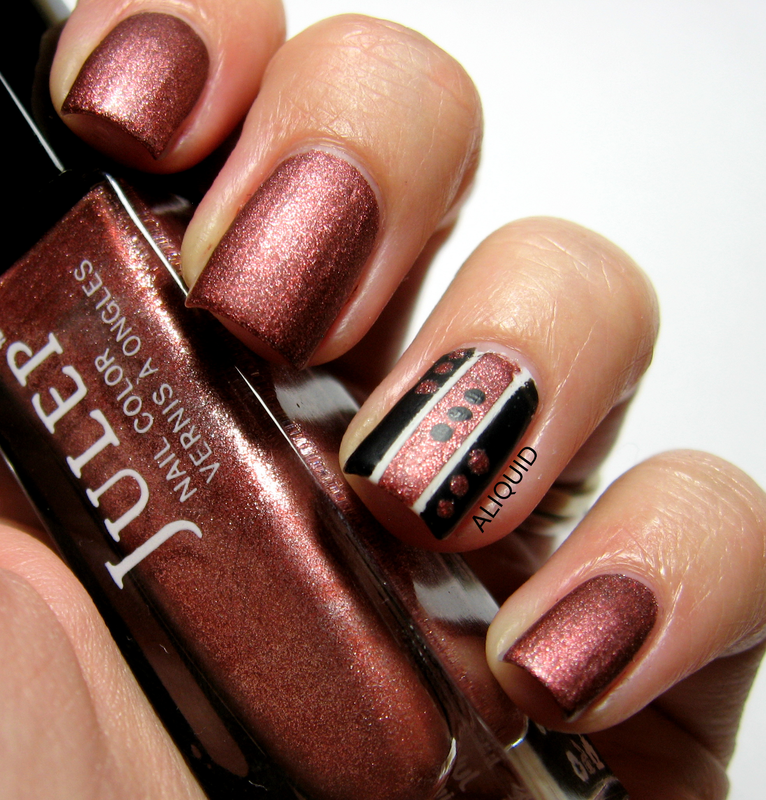 Incoco Topaz Treasure Nail Polish Appliques, with one coat Out the Door topcoat. As with the last set of Incoco appliques I tried, these were easy to use and went on without wrinkles or bulges. Since they're made of nail polish, I used appliques that were slightly too wide for each finger and cleaned up the excess with acetone. I think this allows you to get a better fit to your cuticle shape. I added a coat of Out the Door to seal in the edges. The only thing that bugs me about these wraps is the faint horizontal lines you can see--those are from stretching the appliques to remove wrinkles. A minor quibble though! Topaz Treasure is currently on sale for 25% off ($6.74 down from $8.99) at incoco.com, so go grab 'em! The sale goes through Monday! New stuff on the blog, including ads and ad swapping! I've been a busy beaver today! You may notice a few new buttons up above: first, "Things I Love" is a page of, well, things I love. Blogs, products, indie polish brands, you name it! Maybe you can find a new thing to love somewhere in there! Second, I have a page called "Sponsorship", which explains how to purchase ads in my sidebar (only $2 per month!!). Or if you're interested in swapping ads with me for free, just use the promo code SWAP. I think it'll be a great way for me to meet new blog-friends! 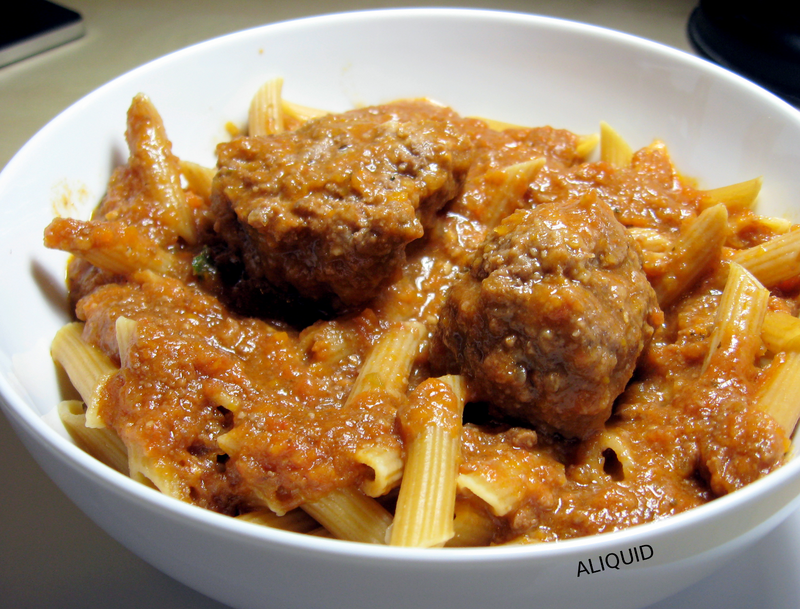 Preheat the oven to 350 F. Combine all the meatball ingredients in a bowl (use your hands! It's like delicious-smelling Play Doh), then form into balls. In a cast iron skillet or Dutch oven, heat some olive oil on medium heat, and brown the meatballs on all sides (this prevents them from falling apart, as I discovered...). Remove the meatballs and set them aside, and add a little more olive oil. Saute the veggies and garlic until softened. Seriously guys, this stuff is so good. Not overly sweet like some tomato sauces, lots of good vegetable flavor, and really moist meatballs!